The World of Tanks L2P Guide! It's my team's fault. RNG screwed me. Match maker is at it again. Stupid game mechanics. Another Lemming Train. Buckle up - it's hard truth time. ​You are the deciding factor in your success in World of Tanks. While it's easy to blame other people and circumstances, the bottom line is you are the only unchanging variable in your matches. In every battle you get to control 1 chess piece on the board, and it's your responsibility to know how to use it. My focus with this training guide is about core skills acquisition. Many new (and old) players are focused on getting to the next tank, to the next tier. This guide sheds that attitude and focuses on meeting a tanker where they are in their journey and helping them to the next step regardless of number of matches or number of tanks. My approach for you to getting better at world of tanks, is teach you core skills, and knowledge. As you learn and apply these skills in game you should see a measurable improvement in your play. I recommend you read everything in this guide, however my goal is to use your current recent WN8, as an indicator of your current understanding and to help you gauge what core skills might help you get to the next level (color). 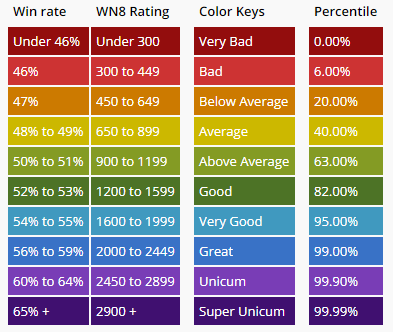 If you aren’t aware - there is a 3rd party rating scale of player skill level called WN8. It isn’t perfect, and lacks in some aspects for rating a players skill, but it's a decent baseline to help you understand where you are, and help you measure your improvement over time. To know your rating I suggest you visit wotlabs.net or tanks.gg and type in your tanker name and select your region. Your recent WN8 is your rating for the last 60 days, or last 1000 battles. There is more detail in each section in the links below. If you aren't sure where to start I suggest starting at the top, and make sure you fill in any gaps you might have as you read on. I want to be very clear here. The stats you have now, or the color of your current stats is not important. What is important is being able to track improvement in your game play. Whether you use WN8, PR, or win rate, you should have some measurable way to track improvement. For me it was win rate and WN8. Select the range below that your current recent WN8 (last 60 days or 1000 battles, written as rWN8) is in. I believe the core skills and understandings in that range (the range you are in) could get you to the next color/WN8 rating if you apply and put them into practice. A new player to the guide heads to the 3rd party site and see's that their recent WN8 is 1013. They see that players with a recent WN8 of 1013 should start in the 'Practical Applications' section. They click on that section and read through the various guides, and begin to apply what they learn to new games. As they master the skills and tools, they refer back to the 3rd party site to see that over the past week their recent WN8 has improved to 1613! After the player feels comfortable with all the lessons they learned, and with their rise in WN8 indicating that they are playing better, they begin to read and apply the next guide 'Optimize and Anticipate.' Rinse and repeat. On a final note, a lot of the information and guides were generated with help from game mechanics experts on the WoT Discord. I recommend you join - it's an excellent place to share your love of tanks, ask questions and find community.